grandMA2 consoles proved to be country strong when they turned out in force for the 2013 CMT Music Awards at the Bridgestone Arena in Nashville. 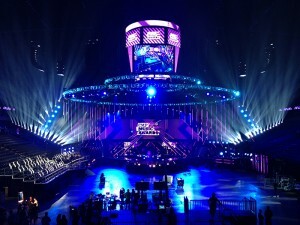 Lighting designer Tom Kenny used six grandMA2 full-size for the gala special, which was hosted by Kristen Bell and Jason Aldean. “The CMT Music Awards is a huge event on the music calendar and gets bigger and bigger every year. It outshines every other awards show,” says Kenny.